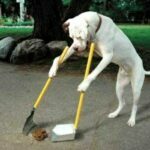 Urine and poop: Whether you’re potty training a puppy or just have a dog who’s a little less than perfectly house trained, you’ve probably had to clean up an unexpected mess. Preparing for accidents can make your life easier if they are frequent. One of our walkers, whose dog was becoming incontinent as she aged, bought a piece of inexpensive vinyl to put down in the area where her pet most often lost control. It protected the wood floors and made cleanup much easier. You could also decide to limit a puppy to a small area such as a kitchen until it is house trained. For urine, first dry up the puddle with towels. Be sure to wear shoes. Then, mix a cup of white vinegar with 1.5 cups of water and pour it over the stain. Blot the stain with a towel again and cover in baking soda. Then, mix hydrogen peroxide with about 1 tablespoon of dish soap, stir, and sprinkle the mixture over the stain. You may want to first test the hydrogen peroxide mixture in a place where it won’t show as it may discolour some carpets. Gently scrub the spot with the solution, making sure that the baking soda gets down into the stain. Once it’s dry, vacuum. Poop requires even more care because it can carry harmful bacteria. After you pick up as much poop as possible, spray and wipe with a disinfectant. Carpet, of course, is much trickier. Pick up and scrape away as much as you can. After that, it’s easier often easier to clean if you let a poop stain dry first. If you do decide to wait, be sure to put a paper towel or some other marker over the area so no one steps in it. Then, use the same method as you did for urine above. Thick carpet may require professional cleaning. Vomit: First, sprinkle with baking soda, then follow advice for cleaning urine.